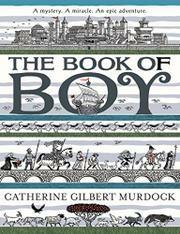 I did not know, going into it, that The Book of Boy, by Catherine Gilbert Murdock (Greenwillow, middle grade, Feb. 2018) is in fact not straight medieval historical fiction, but fantasy. And it was rather lovely to watch the fantasy element unfold (those who have read the book--please appreciate what I did just there! ), so this is a tricky review to write, because if you haven't read it, you will likewise enjoy it more not knowing anything about this. I will do my best to entice you (because I liked the book) without spoiling it. A child, called Boy, has been tormented and bullied most of his grimy and impoverished medieval life, mostly because he has a hunched back. His only true friends are the animals that love and trust him, and though in the past there were two adults who cared about him, he doesn't really have any hope or expectation that the future holds much. But then a strange man comes to town, and he needs a boy to travel with him on a quest through Europe to recover the scattered relics of Saint Peter (a toe here, a rib there). He is not a kind man, this strange pilgrim, but he is not unkind either; he is not a good man, and is in fact stealing the relics, but he is not maliciously evil (in short, he's a lovely complicated character with an interesting back story that explains why he's stealing the relics and the reader (me) is in doubt for a long time about him, which makes for very good reading!). Boy is in doubt about him too, but Boy also learns things during their journey together that expand his own world rather awesomely. Saints are real, and so are miracles, and so is damnation to hell.....and so is chance kindness, and past sorrow. So basically what you get is a medieval heist book with a lot of historical detail, interesting characters, vivid descriptions, and considerable emotional involvement. If you love animals, you will appreciate the many animal friends Boy finds along the way. It's a beautifully immersive experience, and there was nothing in the historical fiction part of it that annoyed me. Kirkus gave it a star, saying "Along with a story that unravels to reveal that not everything in the world is as it appears, Murdock delivers a wickedly fun-filled quest that twists and turns with lyrical fire. Boy ponders: “Pilgrim he might be but this man has sin stitched into his soul.” The story is, among other things, an exploration of religion, Secundus’ thieving quest for relics a counterpoint to Boy’s stalwart faith." I would like to quibble gently with this, pointing out that fear of eternal damnation, such as Secundus suffers from, is in fact a sign of pretty strong faith....and Secundus is more a counterpart to Boy in terms of dark past vs innocence.....But the fact that one can have this sort of discussion about the book shows that there is a lot to it. The Book of Boy is already getting Newbery buzz, and it's deserved. I have been eyeing this one but wasn't too sure about it, but I think I might have to give it a try now, I am curious.